Until about 400,000 years ago, Homo sapiens was just one of the many mammals eking a living in the African savannah, busy finding something to eat while trying to avoid being eaten. 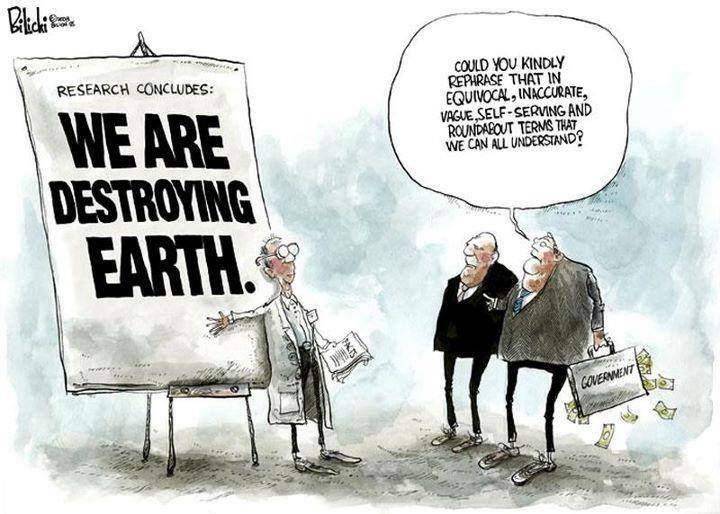 In a relatively short time, and in ways now reasonably well understood by anthropologists, we have become technologically savvy to the point that we are now capable of dominating, and likely destroying, the whole planet. The reason why I am not in awe of this extraordinary development is that humans have been unable to develop, in parallel to their technological prowess, the moral stature necessary to control their brutal strength. This has made of them, essentially, a race of brutes. Quite frankly, I am not at all impressed. Having grown increasingly disconnected from nature generation after generation, humans have lost the sense of where they really belong, and most people today think of nature as an optional, to be kept outside of their cozy existence. Sheltered inside the protective cocoon of an imaginary reality, humans see nature mostly as something of a nuisance to be protected against. Alas, the physical world in which we live is still the master, whether we like it or not – earthquakes and hurricanes docent – so this attitude of natural denial is likely to bring about mankind’s demise. Furthermore, it is also the cause of the most pernicious indifference and lack of interest for the natural world, and most damningly, of indifference for the damage we increasingly inflict on such world. 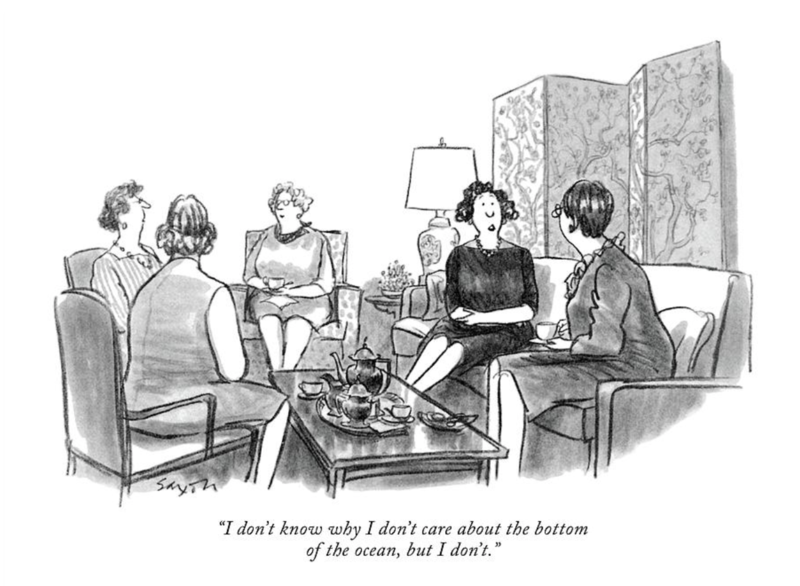 In this classic cartoon by Charles Saxon, appeared on the New Yorker in March 1983, what is striking is not only the indifference but also the inability to understand what reason there could possibly be for caring about the natural world. The ethical consequences of this dystopian approach are staggering. Take for instance human attitude towards non-human animals. The very concept of dualism of humans vs. animals is misleading, as there is no such dualism, and humans are nothing but animals. However, quite conveniently we have convinced ourselves that such dualism is real, so that in our mind we can divide the world between us and all the others. Only we, the humans, are created in the image of God, only we have a soul, only we have an immortal destiny, etc. Everything else is inferior, created by that same God to be at our disposal, and has no rights. Even now that science is telling us what insightful people knew all along, that non-human animals have personalities just like us, are capable of feeling joy and despair, love and fear, can make plans and play politics – in a word, are persons in no way different from human persons – the dualism persists unabated, as if it were a hard-wired feature of our brains. No matter what, on the one side it is us, with full rights, and on the other it is them, nothing more than some sort of animated things. Observing this I get a nauseating sense of deja vu, of the days when whites had created a dualism between them and blacks, and men between them and women. Now everybody looks back at those days horrified. But the change that has occurred from those days is far from complete. Once you recognise that the other (in the past it was the blacks and the women; now it is the elephants, the apes, the wolves, the dolphins, etc.) is capable of thoughts, feelings, fears and passions just like you are, what could possibly be the ethical grounds for considering this other an inferior being, and for treating him with discrimination and even disrespect? What is there in the fact of belonging to a different species to provide a justification for such difference in treatment? I am truly blown away and outraged by noting that so many humans who live a just life, and are compassionate and sincerely concerned for their fellow humans’ wellbeing, just don’t get the ugliness of tracing such an arbitrary line in the sand across what is undeniably an interspecific commonality of feelings, aspirations and needs. 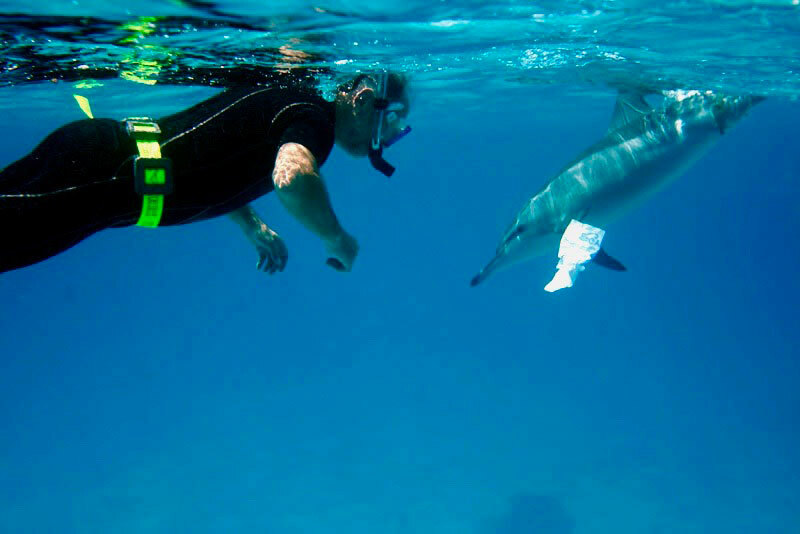 This game of retrieving a piece of floating plastic was initiated by a wild spinner dolphin. The farther I threw the plastic, the faster the dolphin would bring it back to me. After a while the dolphin got tired and left, and when I got back to land I took the piece of plastic to the trash. Samadai Reef, Egypt, June 2006.